Thinking of a short break away? It’s fair to say that for most of us Shropshire isn’t the first destination that springs to mind, but it’s not been called one of England’s ‘best kept secrets’ for nothing, so we thought we’d take a closer look! Visit the World Heritage Site, Ironbridge Gorge with its ten museums – a fascinating glimpse into the history of the birthplace of the Industrial Revolution. Take a breath-taking walk to the summit of the Wrekin (forged as legend would have it, when a tired giant dropped a shovel of earth on the way to Shrewsbury! ), little wonder then it was the setting for Middle Earth in Tolkien’s Lord of the Rings. So, on to the county town of Shrewsbury…located on the River Severn, this medieval market town with its red sandstone castle, is a shopper’s delight, especially if you are looking for something different. For all foodies, a visit to Ludlow is calling… this historic town has a reputation for its gourmet delights and with a great selection of restaurants and cafes you will be spoilt for choice! Other market towns worthy of a visit include Ellesmere, Market Drayton and Bishops Castle, all with their own unique character. It may sound a cliché but Shropshire really does offer something for everyone! 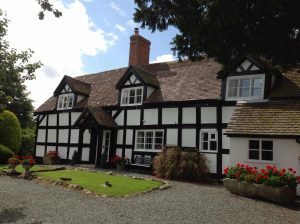 Interestingly, the main photo on the cover page is of Rectory Farm one of our B&Bs in…yes, you guessed it Shropshire! See more information about the interesting county of Shropshire and a list of its towns and links to the B&Bs.